Robert Mills, “Mills' Proposed Plan of the Mall,” Histories of the National Mall, accessed April 25, 2019, http://mallhistory.org/items/show/355. In 1840, Secretary of War Joel Poinsett commissioned Robert Mills to create a plan for the recently proposed Smithsonian Institution's building and the grounds from the Capitol to the future site of the Washington Monument. 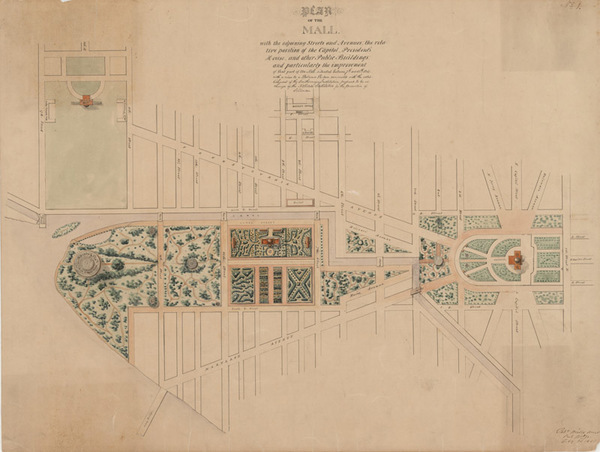 Mills broke the Mall into sections, with formal botanical gardens near the Smithsonian Building, which he set on the north side of the Mall. The area near the Washington Monument was meant to evoke the wilderness, with numerous trees and curving pathways. Only a portion of the plan, the landscaping for the Smithsonian grounds, was ever developed.